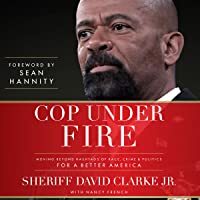 Cop Under Fire: Moving Beyond Hashtags of Race, Crime and Politics for a Better America by David Clarke Jr.
We’d love your help. Let us know what’s wrong with this preview of Cop Under Fire by David Clarke Jr.. 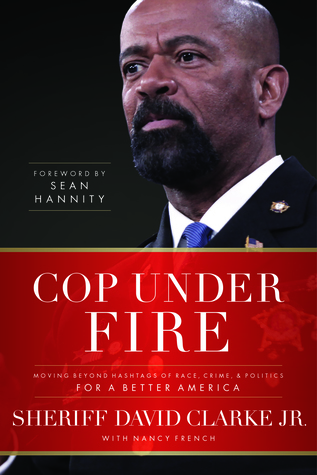 Preview — Cop Under Fire by David Clarke Jr.
America has become increasingly divided and polarized in recent years. With growing racial tension, animosity toward law enforcement professionals, government corruption, and disregard for the constitutional process, there seems to be no easy answer in sight. But Milwaukee County Sheriff David Clarke knows where we must begin. To ask other readers questions about Cop Under Fire, please sign up. I returned this book to the library without double checking. Towards the end he lists the various attacks we have suffered as a country. In the 9/11 sections take offs and landings are mentioned. Isn't the reference backwards? Do I have to buy this book if I have Prime? This book surprised me. Expectations were that it would be bombastic and possibly a 3 or at most a 4. Or possibly a 2. Nope, not even close. He's incredible. Not only is he monster brave but he writes well. As well as he speaks, and maybe even better. But more than his superlative recounting of his own life, his roles lived in youth, and his path to 4 consecutive election successes to head the Milwaukee police department- his articulation for the inner city policing balance is superb. Actually t This book surprised me. Expectations were that it would be bombastic and possibly a 3 or at most a 4. Or possibly a 2. Nope, not even close. He's incredible. Not only is he monster brave but he writes well. As well as he speaks, and maybe even better. But more than his superlative recounting of his own life, his roles lived in youth, and his path to 4 consecutive election successes to head the Milwaukee police department- his articulation for the inner city policing balance is superb. Actually the very best I've ever come across. And working with cops and nurses for 15 years in university researching for their degrees, that's saying something. Many of the most brave, are and can be of the least expressive. That's my opinion. And also most of theirs by observation also. They operate, oftentimes, on essential gut and "feel" for mood and placements around their physical selves. And from years of doing so, the words are rarely, rarely their strong points of connection. Even the specialty officer of practiced interrogation- he or she often times has to go from "feeling or vibe" 1 to violent object coming toward them at count of 3. Faster than that. So they often don't detail in the steps toward the conclusions in the same way as David A. Clarke Jr. can. And DOES here. It's because they are so practiced in the defense. More than the offense- they certainly are. But Sheriff Clarke!! He enumerates and he is exact in his details. His personal "eyes" minute to minute and second to second in precise break down. The account of the public highway car chase lasting more than the 18 minute threshold of immense danger- that one was 6 star. And the aftermaths of explaining he had to do for the foot on the neck. That was a 7. His plans for DOTS programs for prison inmates is superb. Instead of all those useless practical applications money waster classes they presently consume? And his "meatloaf" and the resounding stats for his special bad behavior programs are incredible. A prisoner who asked to have his sentence extended to "finish"! But I've seen the same as that prison inmate- a human whose eyes finally "get" it and understand at some central core that violence is no longer a feasible power grid of top importance central pivot to their life. The chapters on his political party affiliations are hilarious. Especially upon how the Democratic convention and party member greeted him. And how he interprets party line loyalty too. But the best parts were his numbered realities of "mindset" and the individual answers to them that he has incorporated into this system. Oh what incredible success he has achieved toward unity and against racialist identity in his state. Please, please- send a group you have mentored SOUTH. PLEASE, Sheriff Clarke. And the personality he has just radiates like the aura the saints were supposedly arrayed with in Renaissance paintings. Read why he wears the cowboy hat and the boots. And read about his Dad. Mom a school clerk /secretary for the entire school (just like mine) and Dad after years at war, a postman for the rest of his life (put Streets and Sans. for postal and just like mine as well). And he's seen it go down. And calls the racebaiters by name and deed, as well. If you want stats and references there are page after page of those. Men are NOT in prison for minor offenses or drug charges either. They are in jail for VIOLENT behavior. And even then it is not minor violent behavior, nor in singular offense either. His answers are the best I've come across yet for the gang, ghetto locale violence level reality. And he actually has years of following through to consequence of vast improvements on many of those methods for dismantling too. Highly rec. this read if you want to know the real origins, founders, purposes and marketing to Black Lives Matter. He takes each case too and witness /trial reality for every one of them. And also clearly addressed how the Ferguson Effect has resulted in thousands of deaths. Nearly all of black youth, on top of it. This man has some of the most exact answers with complete transparency for all and he walks all the walks. His wife says he is almost a peaceful smiling recluse at home. Not away from home, he is not. But what I admire the most about him is his emotional and cognitive antennae. As demonstrated in his interview with Don Lemon which I happened to see in real time. Police are there to ENFORCE the laws. They do not make the laws. But they also and CANNOT by oath, choose to enforce some laws and not others. They have been given impossible tasks and Sheriff Clarke is one of the few who has drawn the line on where, what, and how that task by its exact definition has been violated and obstructed by "know betters". Watching the news everyday, I see my beautiful America being more and more divided...and not only by race. I've heard the reports of so many law enforcement officers across the country being targeted because of the uniform they wear. I hear about all the black on black crime that involves innocent people, we well as gangs. It seems to get worse each day. This is not the normal book I would choose to read. I've seen Sheriff Clarke on the news, giving speeches here and there. He talks common sense, Watching the news everyday, I see my beautiful America being more and more divided...and not only by race. I've heard the reports of so many law enforcement officers across the country being targeted because of the uniform they wear. I hear about all the black on black crime that involves innocent people, we well as gangs. It seems to get worse each day. This is not the normal book I would choose to read. I've seen Sheriff Clarke on the news, giving speeches here and there. He talks common sense, which is what attracted me to him in the first place. In this book, he talks about the problems, but also gives the reader some potential solutions ...as he sees it. The reader gets to take a peek at his upbringing ... that which has made him the man he is. Everyone should be as blessed to have a strong, loving family for support. For those of you who wonder, this is not a book only about race. It's about our country, our citizens, taking a look at the problems playing out in front of us every day. This is not a preachy book. It is very well thought out and very well written. I actually bought this book for my son who so graciously said Thank You ... and Give It Back To Me After You've Read It. So, thank you Ray. We'll be sure to discuss this one once you have read it. What a great read, informative while entertaining. This was an easy read, it flowed very well. I think my favorite parts were stories about his Dad. What an amazing man! And his son turned out just as well. He has had such an amazing career and it is interesting to see his thoughts on how things are lining up in the world currently. While I am rarely surprised by politics, I am always in disbelief over the partisanship of it, and this book high lights that well. This book would be considered conser What a great read, informative while entertaining. This was an easy read, it flowed very well. This book would be considered conservative I suppose. I see it as common sense. I read this book cover to cover. Hearing his take on hashtag social justice warriors was interesting and eye opening. He is willing to be blunt and honest regardless of party affiliations. I couldn't agree more that dividing things just by party line instead of by what makes sense is ridiculous. When someone has a great idea but it is dismissed because of which party you think came up with it is ridiculous. I loved the book. I highly recommend it. It is well written and informative on current events. I received an advanced reader copy in exchange for an honest review by Netgalley. How I wish there were more voices like Sheriff Clark's out where people could hear. The first time I saw Sheriff David Clarke was on a YouTube clip of Don Lemon's news show on CNN (I would never willingly watch a Fake News network such as theirs). This was in the wake of the Baton Rouge shootings perpetrated by a Black Lives Matter terrorist which left three officers dead and three others wounded. Don Lemon had Sheriff Clarke on the show that night and asked him if the police community's response to these murders was that of "peace" and "unity." Sheriff Clarke was not having an The first time I saw Sheriff David Clarke was on a YouTube clip of Don Lemon's news show on CNN (I would never willingly watch a Fake News network such as theirs). This was in the wake of the Baton Rouge shootings perpetrated by a Black Lives Matter terrorist which left three officers dead and three others wounded. Don Lemon had Sheriff Clarke on the show that night and asked him if the police community's response to these murders was that of "peace" and "unity." Sheriff Clarke was not having any of that politically correct crap, not after his fellow officers were killed in the line of duty. Without missing a beat, he swiftly took control of the interview and asked Lemon if he honestly believed that anyone would have such a kind message during these dire times. He plainly stated that the police were under attack thanks to the racist rhetoric of terrorist organizations like Black Lives Matter; Lemon was taken aback and could hardly muster a coherent response to Clarke's astute statements. He continued to speak firmly and concisely regarding the lack of protests and outrage over the deaths of the police officers, whereas riots would break out at every instance of a police shooting of an African American, justified or not. Lemon couldn't figure out what was going on! He seemed all too eager to end the interview with Sheriff Clarke and finally silence the man who had made him look and sound like an absolute fool (more so than usual, that is). Clarke made his point loud and clear: a war has been declared on the American police officer, and it was about time someone took a stand against this appalling crusade that seeks to demonize and chastise the men and women who sacrifice all to uphold law and order. And so, I was introduced to one of the sharpest and most fearless political minds in America today. 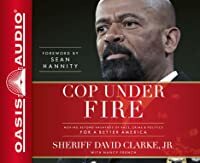 In Cop Under Fire, Sheriff Clarke presents a uniquely qualified perspective on the issues plaguing America today. As a product of a blue-collar African American family, and as an officer of the law for nearly 40 years, Clarke is able to shine a light on the realities of being both a black man and a police officer in today's America. His insight does not come from a singular source, but rather from a combined set of life experiences. He understands race relations on a far deeper level than most talking heads on the news these days because he has lived through adversity himself. He sees through the facade of Black Lives Matter and calls them out for being the race-baiting, hate-spreading terror group that they are. At the same time, he calls out our ineffective and incompetent federal government for the various ways in which it promotes an unsafe America and, by proxy, prevents African American families from prospering. He doesn't blindly choose a side by ignoring the intricacies of each individual situation – he acknowledges how complex these issues are and offers rational answers to help solve them. One of my favorite things about Cop Under Fire is that it unabashedly supports Blue Lives in an age that seems geared mostly towards demonizing law enforcement and making them out to be inherently racist killers. Police officers have one of the most difficult occupations in America today – upholding the law and protecting innocent civilians in the face of constant danger. For the most part, this is a thankless job, and it often yields much criticism and malign as opposed to praise and celebration it truly deserves. In recent years, the police have been accused of being institutionally prejudice against minorities because of several instances involving supposedly unjustified shootings of black men. What's worse, our politicians have been bending over backwards to admonish our police by reaffirming the belief that they are all just racist killers with a badge. Think about how much that must hurt a well-meaning police officer who only wishes to make a difference in his or her local community; it's a damn shame! Yet despite these allegations and attacks on the police, they manage to put on their uniforms each day to serve and protect their friends, families, and neighbors; all the while protestors, news anchors, and politicians threaten their livelihood, reputation, and safety. Sheriff Clarke knows all too well that the police are under attack on several fronts, and he makes it clear that he stands with them and their cause wholeheartedly. As an avid supporter of the police and law enforcement, I am glad to see someone stick their neck out for those who deserve it. You will be hard pressed to find much public support for the police nowadays thanks to misinformation and hatred causing people to fear and despise those who have taken a vow of duty to protect them. Sheriff Clarke touches on a number of topics in Cop Under Fire. He talks about the post-9/11 America being just as unsafe as before those fateful attacks on out freedom and sovereignty. He discusses the double standards of being a conservative African American who does not conform to the mold of a "typical African American" as enforced by liberal social justice warriors. Sheriff Clarke dissects each of the major police-related deaths of African American men and proves that none of them were racially motivated by supposedly "racist" cops. His views may be controversial, but they spoke to me in a way that most politicians and news anchors have not been able to – he speaks the truth, unabated by political loyalties and special interests. Though I tended to agree with the vast majority of what Sheriff Clarke spoke about in his book, I found him to be a little too religious for my liking. He felt that religion was under attack in America, but I don't agree with that. In fact, I think religion has too much standing in our policy and governing, which causes more harm than good in many cases. Though I respect Clarke's religious point of view, I don't think it was wholly appropriate to imply that religious liberties needed to be strengthened even more so than they already are. For example, he didn't see any problem with integrating religion into his mandatory police briefings. This, of course, is an infringement on the religious liberties of those in the police force who do not worship the same religion as Clarke. Since this was a mandatory meeting in the department, they did not have the option of walking out to avoid having to be subjected to a conflicting set of beliefs and values. Though Sheriff Clarke has a right to follow whatever religion he wants to, he does not have the right to impose that religious view unto others who are unwilling to have their convictions challenged. As someone who is not too fond of any religion in general, I know I would like to have my personal views respected and not have to be subjected to religious lectures whilst at work. On this front, I do not agree at all with Sheriff Clarke. On a technical note, I felt that Cop Under Fire could have benefited from having a more concise focus throughout . That is to say, I felt that, at times, the book did not follow a very clear-cut narrative or point, and it consequently felt a little erratic and vague in its message. For example, he discusses the TSA and its ineptitude regarding airline safety in the post 9/11 America. Even though he eventually gets to his point about the government's overreach and ineffectiveness, I thought he took a rather considerable detour from the rest of his book when he started this particular chapter. Had he made his point in a more fluid and smoothly flowing manner, he would have made his book more consistent and his message less muddled, and thus more straightforward to read. This is mostly excusable, however, since the book does not suffer too harshly from any of these moments. This is an engaging book that I just couldn't put down. It starts out with a brief history of how Sheriff Clarke got into politics and became a sheriff, but then quickly moved on to the issues facing us as a nation and, in particular, the law enforcement officers that serve. He does this by by shining a light on past events and how they've influenced and/or created current problems. It was refreshing to read his no nonsense take on these issues. Even better, he cites biblical passages that expla This is an engaging book that I just couldn't put down. It starts out with a brief history of how Sheriff Clarke got into politics and became a sheriff, but then quickly moved on to the issues facing us as a nation and, in particular, the law enforcement officers that serve. He does this by by shining a light on past events and how they've influenced and/or created current problems. It was refreshing to read his no nonsense take on these issues. Even better, he cites biblical passages that explain his perspective in a way that makes sense. Our law enforcement officers are under attack and it is so frustrating to watch from the sidelines. While the author is a democrat, he has a no nonsense and conservative approach to the issues and solving problems. Our nation would be a much better place if more shared, and acted upon, his ideas. As the mother of a LEO, I say thank you Sheriff Clarke. Thank you for standing up, even when it seems like you are standing alone. This part of the silent majority salutes you and values your service and your fearless stand for all of us. Sheriff Clarke does an amazing job sharing his journey from being a captain in the police department to being the Milwaukee County Sheriff. He is not political as a person, but is forced to declare a party to run for office. Raised in a democratic family, living in a democratic county, Clarke chose to run on the democratic ticket. However, his conservative views put him at odds with both democrats and republicans. He could be likened in his views to President John F. Kennedy. Conservative based Sheriff Clarke does an amazing job sharing his journey from being a captain in the police department to being the Milwaukee County Sheriff. He is not political as a person, but is forced to declare a party to run for office. Raised in a democratic family, living in a democratic county, Clarke chose to run on the democratic ticket. However, his conservative views put him at odds with both democrats and republicans. He could be likened in his views to President John F. Kennedy. Conservative based on principles and democratic based on location and family line. However, the book is not about politics though it is mentioned out of necessity for running for public office though in the area of law enforcement, this should be removed and allowed to be independent. This book does cover law enforcement from an overview historical perspective. Clarke does an excellent job sharing the ends and outs of being on the street, his love for being out on the beat with his men, his desire to put criminals behind bars and his desire to protect innocent citizens. His heart comes through loud and clear. This is a really good analysis of our country and many of the issues we face. I enjoy Sheriff Clarke's perspective. He's self aware enough to recognize that his view comes from a law enforcement perspective and he takes off the jaded glasses to get an honest look at our situation. This book is very down to earth and logical. If anyone has the right to address cop vs. black problems, it is this man. Sheriff Clarke offers great perspective on how and why he is where is as well as how and why our culture is where it is. But beyond that, he offers practical solutions and possibilities that ought to be implemented. Even better, these solutions are not just his dreaming stuff up. He has implemented these in his life and the lives for whom he is responsible, proving that they work. His solutions are not social experiments. If anyone has the right to address cop vs. black problems, it is this man. Sheriff Clarke offers great perspective on how and why he is where is as well as how and why our culture is where it is. But beyond that, he offers practical solutions and possibilities that ought to be implemented. Even better, these solutions are not just his dreaming stuff up. He has implemented these in his life and the lives for whom he is responsible, proving that they work. His solutions are not social experiments. They are common sense behaviors that have served societies well for millennia. This is a fairly easy read told in an interesting narrative. It might be interesting to see what kind of impact this book might make if it became required reading in high schools. I highly recommend this book. Thought provoking and well-written by a man who has served decades on the front lines as a law enforcement officer. Believes in the rule of law, individual (not group) rights and responsibilities, and local government. Sheriff Clarke is a graduate of the FBI National Academy and has an M.A. in Security Studies from the U.S. Naval Postgraduate School, Center for Homeland Defense and Security. The more I read about Sheriff Clarke, the more I like him. "Cop Under Fire" is inspirational reading. Sure, life has problems but never give up. Take responsibility for your actions. Work to improve yourself. Keep your word. Love one another. Great book. Exactly what needs to be said concerning law enforcement in the brave new world we live in. Political correctness, identity politics, and social media is putting public safety at risk. Sheriff Clarke demonstrates the responses that need to be taken by politicians and law enforcement. Highly recommended! You can tell how good or how bad a book will be in the first couple of pages; rarely do they get any better. Have read the first two chapters and they have been outstanding. So far, a very hard book to put down without wanting to continue reading when you have something else that needs to be done. An amazing read. It is not often that I can say I agree with everything someone says or writes but in this book and in Sheriff Clarke, I can say that without reservation. I knew not what I was going to You can tell how good or how bad a book will be in the first couple of pages; rarely do they get any better. Have read the first two chapters and they have been outstanding. So far, a very hard book to put down without wanting to continue reading when you have something else that needs to be done. An amazing read. It is not often that I can say I agree with everything someone says or writes but in this book and in Sheriff Clarke, I can say that without reservation. I knew not what I was going to be reading about in his book, in fact I thought it was about his days as being an active Sheriff. This book is more about what currently inflicts America and its possible remedies than anything else. He writes just like he talks - no BS! I loved it. He lays out how the War on Police was started and who advanced it throughout America. I don't know what the future will be for Sheriff Clarke but if it is political, regardless of party affiliation, he has my support. This is an uplifting book written when some of the darkest clouds have descended upon America. After reading it I feel as if there may be hope for us afterall. Cop Under Fire? No way GODly man under fire!!!! This is a book of abandonment, agony, also beauty and compassion. The book starts by telling about his parents and how they got together and then how he came along and then he goes on from there - the book has it's good and its bad and then its very bad. He talks about America what it was what it is and what it could be and what it would take to become what it could be and it takes to fix everything in this whole world to bring everything to perfec Cop Under Fire? No way GODly man under fire!!!! This is a book of abandonment, agony, also beauty and compassion. The book starts by telling about his parents and how they got together and then how he came along and then he goes on from there - the book has it's good and its bad and then its very bad. He talks about America what it was what it is and what it could be and what it would take to become what it could be and it takes to fix everything in this whole world to bring everything to perfection is one three letter word - one precious three letter word - GOD - nothing more - nothing less - just GOD - until then there will be gang bangers, pedophiles, rapists, drug addicts, dui and so on and that will keep Mr. Clark in business until he retires and that just breaks his heart but in the end he knows where he will go if taken early by a bad guy or on time by JESUS. Until then he will Continue to pray for his family, himself, his friends, his precinct, his community, and his America and so will I. I received a copy of the book from NetGalley in exchange for an honest review. Brilliant book by a man who is on the 'front line' of the struggle for the soul of our society. Enough of the 'it's everyone else's fault' mentality and start taking care and responsibility for ourselves, our loved ones, and even our country. He says what needs to be said and to those it needs to be said to. He's too smart to do it,but I would love to see him in Washington D.C. I really like David Clark and of course the reason I bought this book. I now have more reason to support this man. He tells it like it is. I support all his actions and wholeheartedly agree with him. The police in the small village where I live are neighbors and friends and care about every citizen that live here. I support our men in blue. TRUTH BOMB. . . ..too much truth in this book for most to handle. . . .common sense, basic ideas which would help fix a great many problems. Not for those afflicted with 'politically correct" disease. ..unless you are looking for a cure. Excellent read. Sheriff David Clarke tells it like it is! I was certainly saddened to hear of his retirement yesterday. America needs more men like this looking out for the welfare of both civilians and fellow officers. This is a must read considering the dangerous climate of the nation nowadays. The popular Sherriff of Milwaukee has done a tremendous service to truth and to LEOs and their families in speaking his mind and in stating many facts here. Wish we could multiply this good man a thousand times! Great book . Touched on all the topics. Just as in his interviews, direct talk with no sugar coating. Great job, Mr. Clarke!!! Excellent book! If this man ran for president of the United States, I would vote for him. Need I say more? Just finished. A FANTASTIC book about the realities of today's world and the realities within the law enforcement world. A must read for all sociology and criminal justice students. I don’t like Sheriff Clarke. Still I gave the book “3” stars. I was born and raised in Milwaukee. In all of my 69 years of life, I’ve never lived more than 30 miles from Milwaukee. I get the Milwaukee TV stations and read the Milwaukee newspaper daily. I’ve been familiar with Sheriff Clarke long before he became a national media whore. Somewhere along the line, the messenger became bigger than the message. The book talks, in part, about family values, hard work and religious beliefs. Who can argue I don’t like Sheriff Clarke. Still I gave the book “3” stars. The book talks, in part, about family values, hard work and religious beliefs. Who can argue with that? Core principals. That would, in my opinion, include doing the job that one was elected to do. In the last year, four people have died in his jail, including a new born. Yes, the mother had her baby in her cell and the baby died. Also the man who died of dehydration after having been refused water for seven days. An inquest jury has recommended criminal charges against seven people involved with this tragedy. Maybe he should stay in Milwaukee and oversee his jails. In the book Sheriff Clarke is often critical of past Presidents, and other elected officials. Ok, I get that. He has differing opinions. However, he has “snarky” nick-names for a lot of these people. Really? That sort of takes away from your work David! Of course if he wants to be snarky, let’s talk about his hat and ribbons. The ten gallon hat…. no, it’s probably bigger. The hat would make a great fashion statement in Dallas, Texas. However Sheriff Clarke lives and works in Milwaukee, Wisconsin, hardly cattle rustling territory. A writer in some magazine commented on Sheriff Clarkes many ribbons. Yeah, he has more ribbons than a World War Two Five Star General. What are they all for, perfect attendance, good penmanship? Perhaps he was the captain of the crossing guards? Maybe he really had a desire to be on the cover of The Beatles “Sgt. Peppers” album. His book does show his confidence. He certainly does not lack in that area. He is so confident that several months ago he announced that he was leaving his position as Milwaukee County Sheriff to take a position in the Federal Homeland Security Program. He had interviewed for a job with them. Unfortunately, the job was never actually offered to him….oooppps! So he’s staying in Milwaukee. Oh well. There is no denying it, Sheriff Clarke has many followers, both in Milwaukee and around the country. He’s like Trump in that respect. Very polarizing. Trust me, if you love Trump, you’re really going to like Clarke. You cannot watch the news and get the whole story any more. You get the story of someone trying to push an agenda who will then take no responsibility when they are wrong. They want to feed and fuel the fires that divide us. the reason why? Control. Complete and total control. If you are an American citizen you are a threat to every politician because you have the authority to take away their power, but you refuse to do so. Why? Because you are too busy fighting other Americans. You are fed stor You cannot watch the news and get the whole story any more. You get the story of someone trying to push an agenda who will then take no responsibility when they are wrong. They want to feed and fuel the fires that divide us. David Alexander Clarke, Jr. was born in Milwaukee, one of five children of Jeri and David Clarke Sr. His father was a paratrooper with the 2nd Ranger Infantry Company. Clarke Jr. attended Marquette University High School. His career in law enforcement began in 1978 at the Milwaukee Police Department (MPD). He "rose through the ranks at a slow but steady pace in his 24 years with the department." Clarke was a patrol officer for eleven years and then a homicide detective; he was promoted to lieutenant of detectives in 1993 and captain in 1999. In 1999, Clarke received a B.A. in Management of Criminal Justice from Concordia University Wisconsin's School of Adult and Continuing Education. In January 2002, Milwaukee County Sheriff Leverett F. (Lev) Baldwin resigned midway through his term to take a pension payout. Clarke was one of ten applicants for the position, and was appointed sheriff on March 19, 2002, by Governor Scott McCallum. He was elected to a full term later in 2002, and has been reelected every four years since then.